The Dolphins are trying to regroup from their first loss, a 38-7 drubbing by the Patriots that highlighted their flaws. Both lines got pushed around , and injuries forced adjustments that didn't turn out so well. CINCINNATI (AP) — The first month shaped up as the Bengals‘ most daunting, with three road games in the first four. The offense and defense were getting accustomed to new systems. And then the injuries began. Running back Joe Mixon tore knee cartilage. Center Billy Price tore a foot ligament. Linebacker Preston Brown sprained an ankle. Linebacker Vontaze Burfict was suspended all month for another NFL policy violation. Cincinnati (3-1) came through it successfully with a handful of big plays and a resurgent Andy Dalton. Now the Bengals are getting some of those important players back as they settle into a more cushy part of the schedule — four home games in the next five, starting with the Miami Dolphins (3-1) on Sunday at Paul Brown Stadium. Things are looking up in Cincinnati, off to its best start since it won the AFC North in 2015. “It’s a new team, a new energy around here,” cornerback Dre Kirkpatrick said. The Dolphins are trying to regroup from their first loss, a 38-7 drubbing by the Patriots that highlighted their flaws. Both lines got pushed around , and injuries forced adjustments that didn’t turn out so well. “It was a humbling experience,” defensive tackle Davon Godchaux said. The Bengals want to keep their momentum going during home games against the Dolphins and against the rival Pittsburgh Steelers the following week. 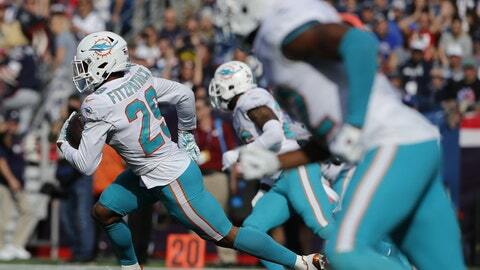 The Dolphins need to pull out of their one-week funk and not allow it to turn into a downward trend. The Bengals’ eighth-year quarterback has been a key to their turnaround, getting off to his best start since 2015 in a redesigned offense. He’s thrown 11 touchdown passes, his best total for an opening four-game stretch. During a 37-36 win at Atlanta on Sunday, he had a perfect passer rating of 158.3 in the first half, when he missed on only two passes. He led a winning 16-play drive, culminating in a touchdown pass to A.J. Green with 7 seconds left. Godchaux hinted that the Dolphins lost a little motivation by winning their first three games, so the drubbing by the Patriots could provide a correction. The Dolphins lead the AFC East despite ranking in the bottom half of the league in many offensive and defensive categories. The Dolphins’ lines have been depleted and got pushed around against the Patriots, who rushed for 175 yards while the Dolphins were held to 172 total yards. Center Daniel Kilgore suffered a season-ending triceps injury, and defensive tackle Jordan Phillips was released after another poor game punctuated by a sideline outburst. Veteran Travis Swanson replaces Kilgore. The Dolphins earlier lost guard Josh Sitton with a season-ending shoulder injury. “We just got crushed,” coach Adam Gase said. The Dolphins have converted 31 percent of their third downs, which ranks third-worst in the NFL. They were 3 for 11 against New England and had the ball for less than 24 minutes. Tannehill has often been knocked for his play on third down. This year his quarterback rating is 72.8 in those situations, compared with 106.1 overall. The Dolphins will be going against a defense that’s last in the league by far on third down, allowing opponents to convert 57 percent of the time. It’s the biggest problem with a defense that’s ranked 29th overall and has allowed the 10th-most points in the league. Cincinnati hopes that getting Burfict back from his four-game suspension for violating the NFL’s policy on performance-enhancers will help fix the problems. “I feel like he balances everything out,” Kirkpatrick said.